I had an interesting polish find at Walmart from Pure Ice. I really haven't paid any attention to Pure Ice in years. I haven't really found anything unique or worthwhile from them. It's a very affordable brand at $2 a bottle. They're a great value, but when you have a collection of my size it's hard to find something original in the mix. I did spot this one recently and was surprised to see a color like this in their line. Poppin Bottles is a silvery-golden glass fleck shimmer with sliver glitters. Color: This instantly reminds me of the type of shimmer glitters from the Maybelline Brocades collection, in particular Silver Swank. 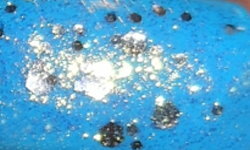 I love this highly reflective shimmer-glitter combination. It's really beautiful, and not something I think really caught on much in nail polish. That being said, in comparison to the Maybelline it's pretty weak. Formula: This formula is very sheer and the larger siliver glitters are very sparse. I used 2 coats over a base. I would find this impossible to get an opaque finish unless you did 5+ coats. Poppin Bottles does apply nicely and easily, it's just a top coat. Price: I paid $2 for this at Walmart. Overall: I have to give it to Pure Ice for creating a polish like this. It's unique to a brand of this value. The polish could be better though. It could be more opaque and more glitter could be added. It's a nice polish, but that's about it. It could be better. Pretty glitter. Love how you paired it! That blue underneath pairs so well with it. That is so pretty. It looks great with the blue.